Wienerschnitzel is launching the new Tastee-Freez Chocolate Nutter Butter Shake and is bringing back the popular Tastee-Freez Chocolate Nutter Butter Freezee. The Chocolate Nutter Butter Freezee is a combination of creamy Tastee-Freez soft serve with Nutter Butter infusion and chocolate syrup, and the Chocolate Nutter Butter Shake features the same ingredients, as well as liquid soft serve to make it a drinkable dessert. The frozen treats are available at participating Wienerschnitzel locations from October 3 through the end of 2010. 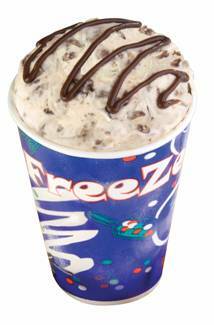 The Chocolate Nutter Butter Shake and Freezee will be offered at participating Wienerschnitzel locations for a recommended price of $2.89. The restaurant chain’s desserts will be supported with in-store point-of-purchase materials.